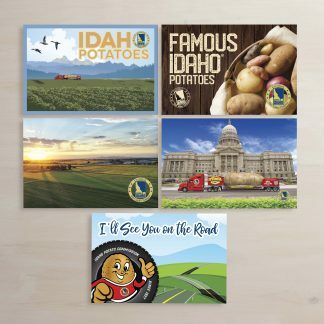 The Big Idaho Potato spent it’s final week supporting the Industry in Idaho which arguably keeps Idaho’s economic dreams afloat. There are many ways of teaching the children about our Agricultural Industry. I have studied it in the halls of I.S.U. I have read various reports about it from a plethora of sources both news like as well as scientific in nature. I know that many other ways exist for which someone might learn about it, but none that I can think of would be as fun as a field trip for first graders. The Meridian Chapter of the FFA, or Future Farmers of America, put together a trip of fun and education for it’s higher grade students. These FFA students were tasked with helping to educate their younger peers. First graders from all over the treasure valley, represented the younger peers and the event was held at the Meridian Professional Technical Center near Meridian High School. The FFA Students were both tour guides as well as being the presenters of knowledge at each station. First graders were presented with displays showing seeds of various grain along with explanations of the crops. They were shown various tools from the industry, some of which, predate my grandparents. There were stuffed variants of animals from bears to raccoons, which the children could feel. Live Cows, chickens, goats and sheep shared the stage and there were even baby pigs and quale. Kids were given a taste of dairy and shown how various items made their way to market. Also available were a few farm implements including a few tractors and a combine. 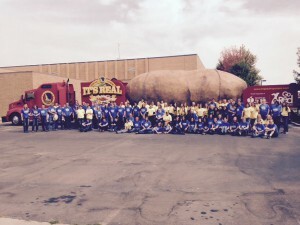 They also got to have their picture taken with the coolest Potato on the planet, as well as having a class picture sitting together on a set stage of hay. Nothing compares to seeing the little ones smile, so if a fun day was meant to be enjoyed by all, mission accomplished. 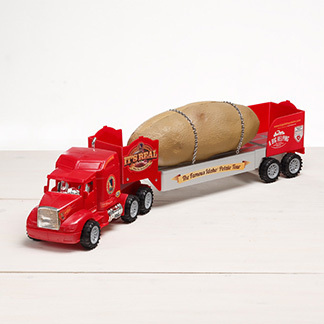 Our final presentation of the Big Idaho Potato, was also Agriculturally related. With my team mates, Ivan and Kristie, Hamming it up in Ohio, I was joined by our tour director, Laura Martin. Laura and I got to drive north through Idaho, which is always a treat for me. Celebrating the Agriculture of Idaho in the beautiful Palouse hills of Moscow Idaho, at the University of Idaho. We enjoyed gorgeous weather and lots of fun responses, on our drive north. Our visit in Moscow, began with a dinner, which was meant to provide some of the leaders of Agriculture, a bit of their due recognition. There were various awards and recognitions, but most prominent for me was a tribute to the late, Leonard “Bud” Purdy. Bud was a cattleman for the bulk of his life, but was best known for his conservationist ways. He was instrumental in implementing and leading the cattle industry in a type of public lands grazing, where you would have the cattle on a plot of land to graze, then move them onto another site, to allow that first plot to rest and recover. He also donated a large plot of land into natural reserves, adjoining another area of the Nature Conservancy at Silver Creek. Silver Creek is a premier stream in Idaho, for trout. Agriculture is an important part of Idaho’s economy as well as an integral part in the well being of the humans of the world. As our populations grow and our farmable lands diminish, Agriculture becomes more and more important. I think we often think of farming as being a thing of the past, but I feel it is just the opposite. 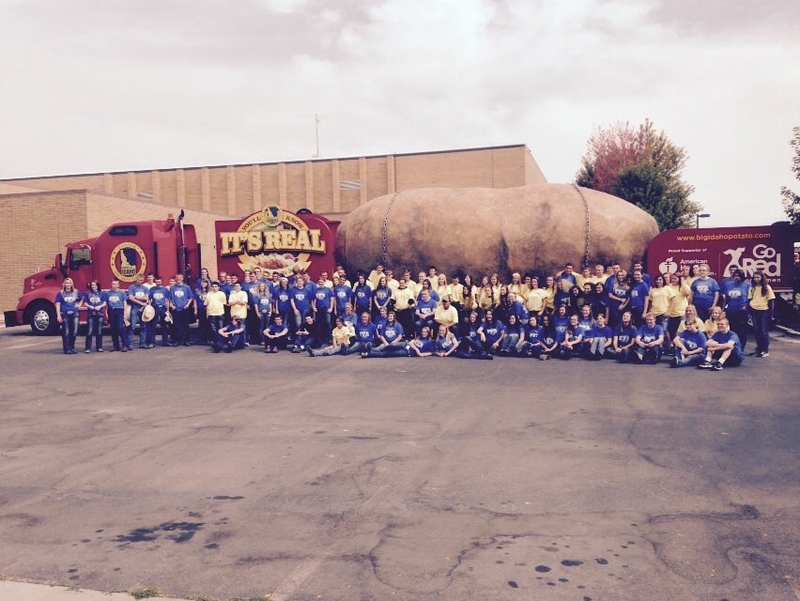 It was an honor to be able to attend and a pleasure to bring the Big Idaho Potato. 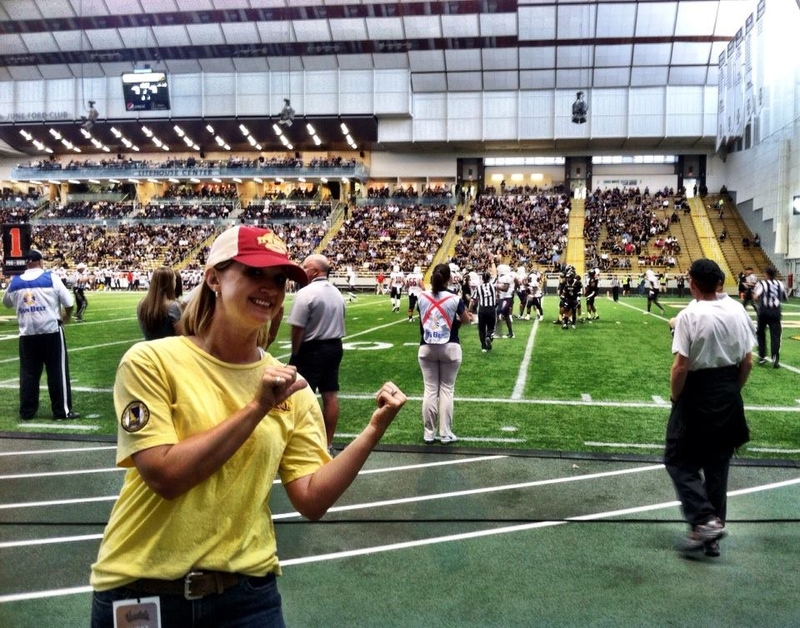 Playing the Jaguars of Southern Alabama, the Vandals of the University of Idaho allowed Laura and I to have front row seats; Make that, side line seats. Laura and I got to, that’s right, stand on the sidelines as the two teams matched up for an exciting night of Football. I’ve always favored football, but would much rather play than watch it. I was quite pleasantly surprised to find that same enjoyment of playing, could be felt while standing on the side of the turf, watching the game unfold. The Vandals gave it their all and ultimately taught the Jaguars a lesson, running up the score an astounding 144 to 15. Traveling back south through Idaho gave me that little bit of remembrance of the Idaho I had left behind back in April, at the start of the tour. It truly is a beautiful state, once you get out of the desert. 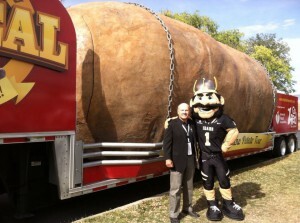 Although I’m glad to be back home again, I will certainly miss the Big Idaho Potato Truck. I don’t know which I’ll miss more, the many places we’ve gotten to visit. Perhaps the many people we’ve met along the way. Maybe I’ll miss most, the simple things; like the people who would wave at the driver of the Big Idaho Potato, who not long ago was me. 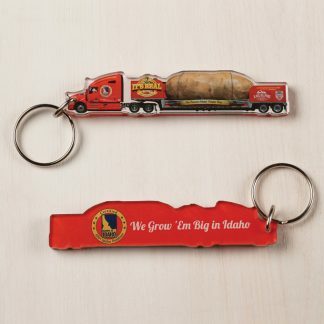 I would like to thank all of the members of the Idaho Potato Commission, for allowing me to represent them in such an awesome way. 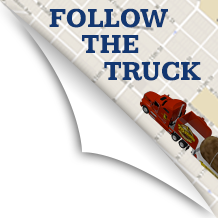 This was certainly a highlight of my life and the best truck driving job on the roads of the U.S. To the rest of the public, thanks too, for making the job so wonderful, with all of your support. Yes I think I’ll miss you the most. If you see me out there driving in my car some day, feel free to give me a little wave.